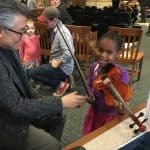 Get swept up in the magic created by great stories and live music as the CCO and Tompkins County Public Library (TCPL) join forces for our third annual Family Concert and Storytime. Encouraged by the tremendous turnout at our first two events, we’ve added a second Family Concert this season! We’ll select a different “note-worthy” children’s book for each date, and feature a variety of instruments to help bring the tale to life with the help of musicians from the CCO. Children will have an opportunity to try out an instrument or two so be sure to bring the entire family. Free admission is made possible by the generosity of our sponsors.